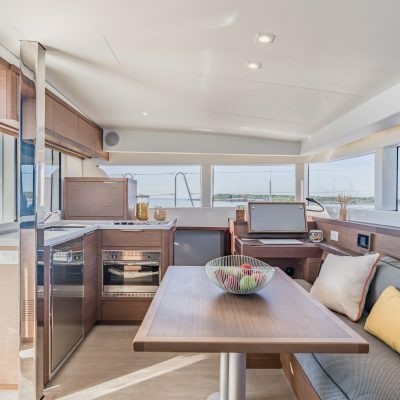 Popular heiress to the 380 with a sleek new style. 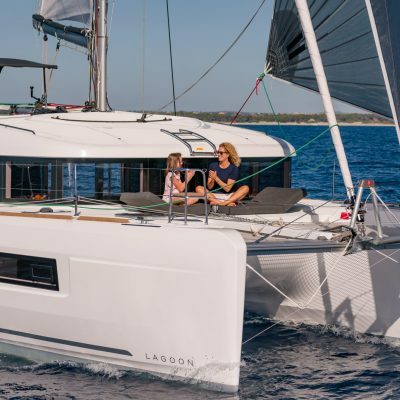 The Lagoon 40 catamaran has a sleek new style and in fact looks remarkably similar to the wonderful Lagoon 50. 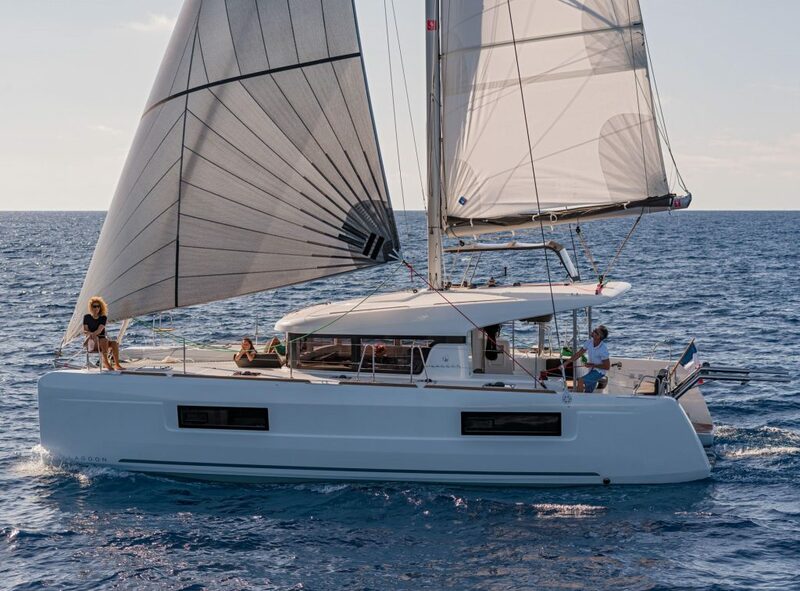 She may also be the model to supersede the enormously popular Lagoon 380 which has sold over 800 boats. 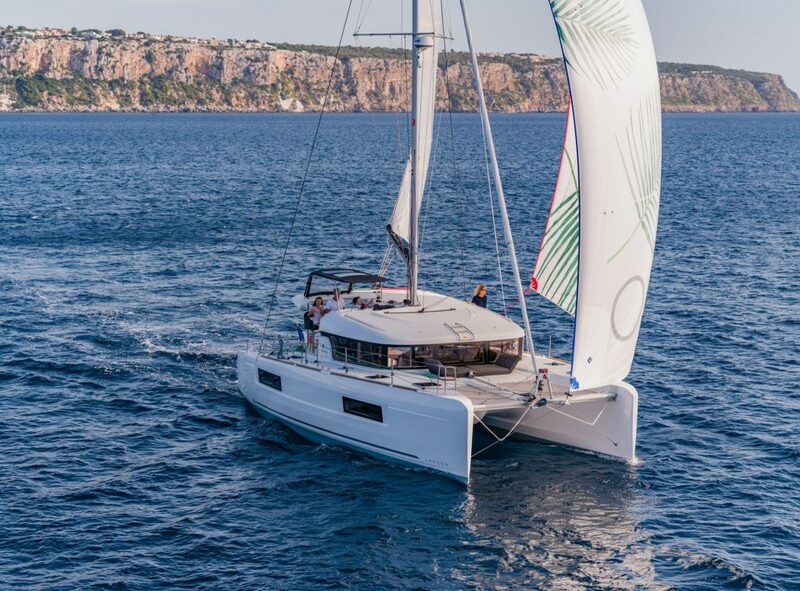 Easy to handle with an ergonomic helm-station, high aspect mainsail, and self-tacking jib. Single level connectivity between cockpit and saloon, with smart, simple and elegant interior design for comfortable and stylish living. Strong, but lighter than her predecessors. Weight distribution is optimized to maintain strength and improve performance. 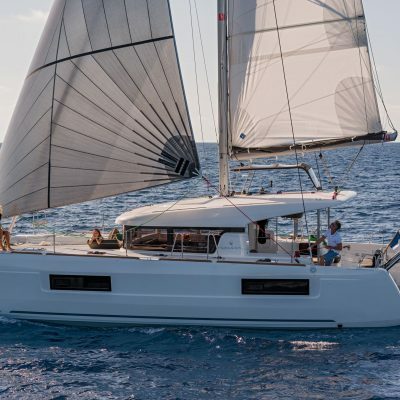 Will appeal to couples and family cruisers looking for a manageable cat capable of blue water cruising. 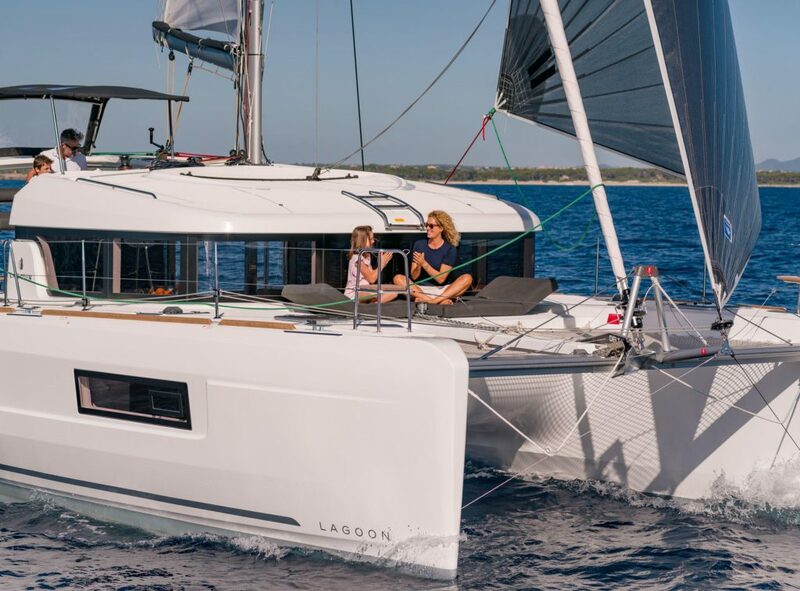 Please scroll down to read more about the Lagoon 40. 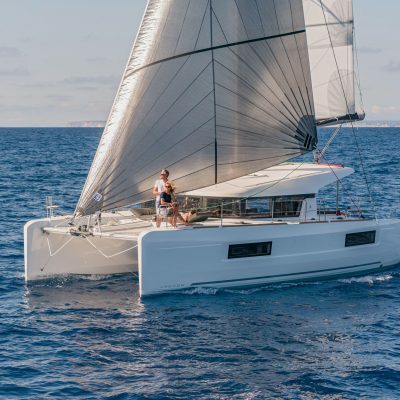 The 60’5” mast is set to further aft as you see on the 42, the boom is shorter and the mainsail smaller with a higher aspect ratio, making it more manageable but without compromising performance. 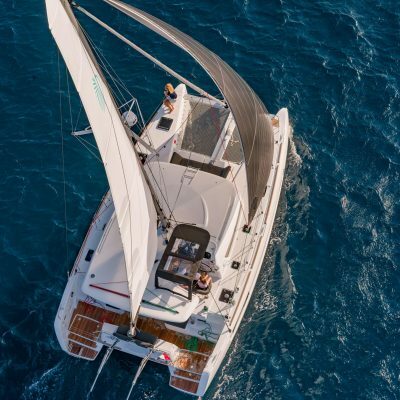 There is a fat-head mainsail option but the standard main is recommended for the Caribbean trade-winds. 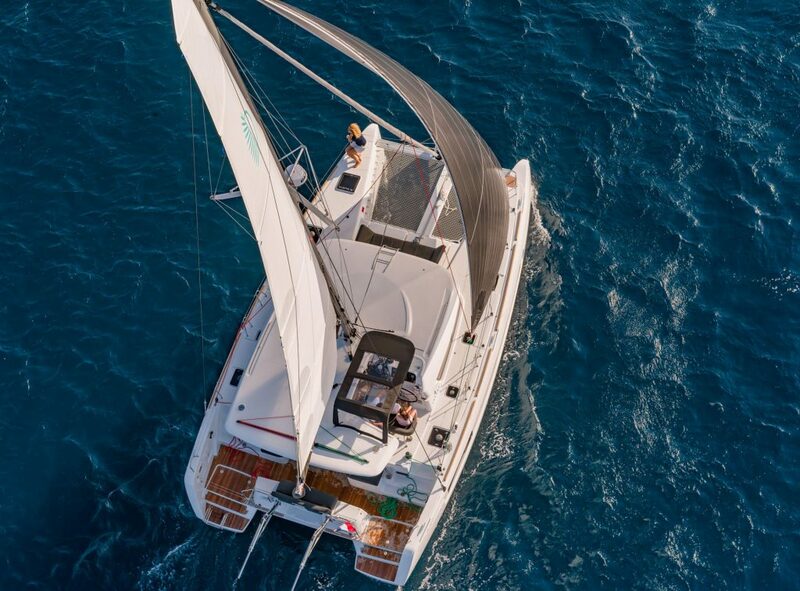 She also has a self-tacking jib which facilitates shorthanded sailing. 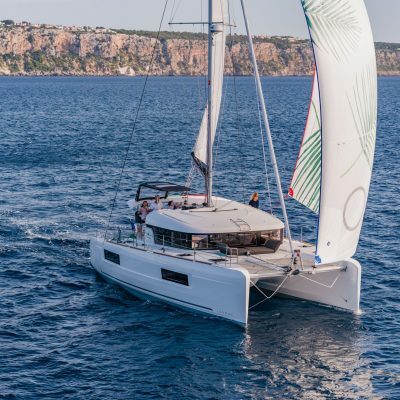 The “white sails” provide plenty of power: in smooth water, with a true wind of 17-20 knots, you will see over 8 knots regularly. 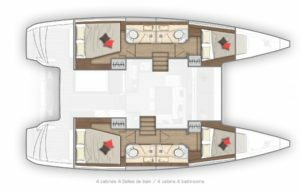 There is an option for a bow-sprit and gennaker which will further improve the off-wind speed – look forward to 10 knots plus. 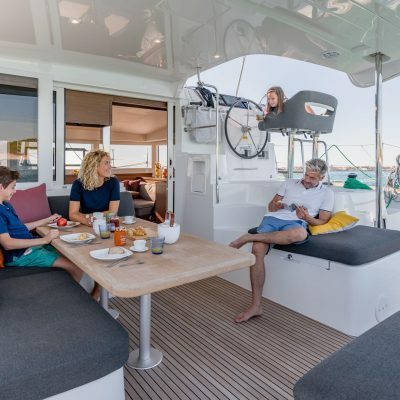 The standard Yanmar engines are 29HP but we would recommend the upgrade to the 45HP just in case there is any powering to windward in some lumpy seas. 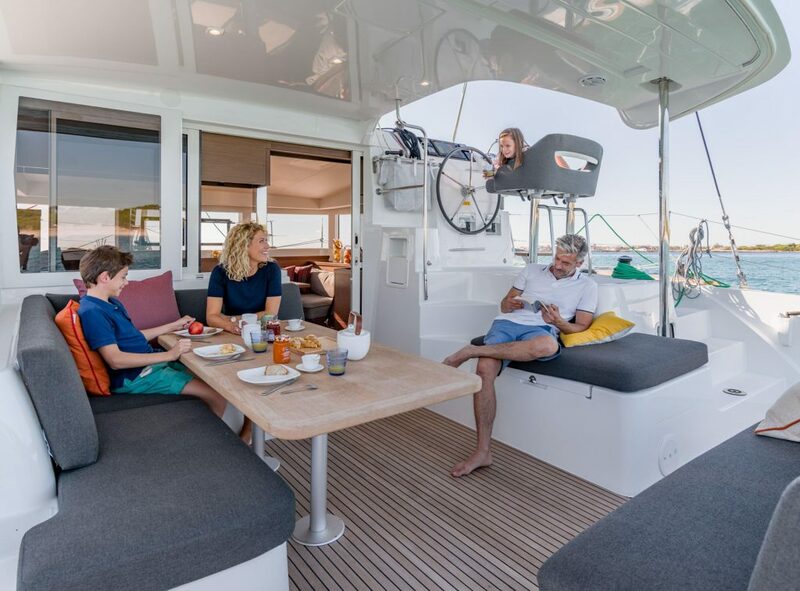 The helm station is compact but with a seat with room for two. 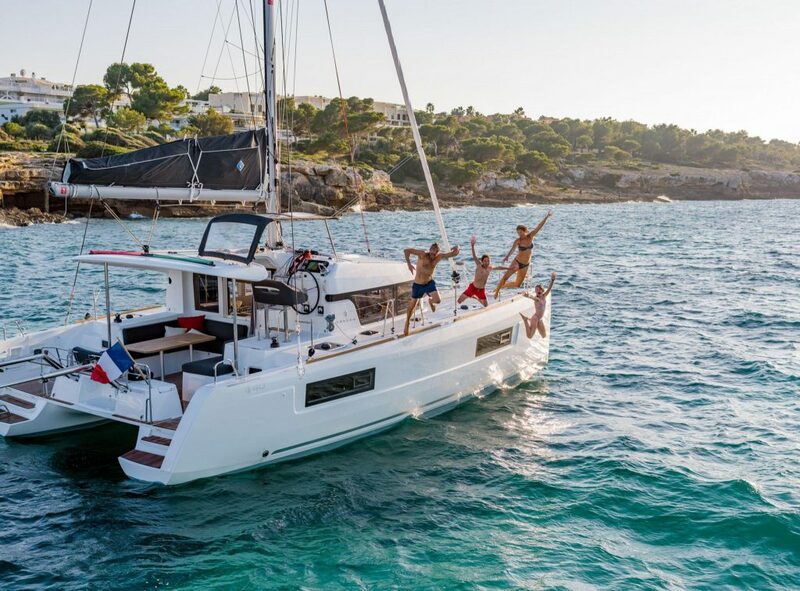 With the mainsail controls, Yanmar engine controls and power winch easily in reach, sailing short-handed is a breeze. 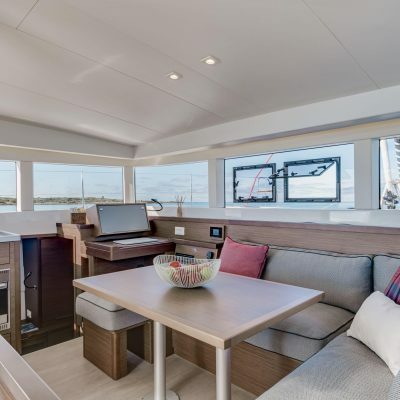 The latest B&G navigation instrumentation is clearly laid out right in front of you and is user-friendly. 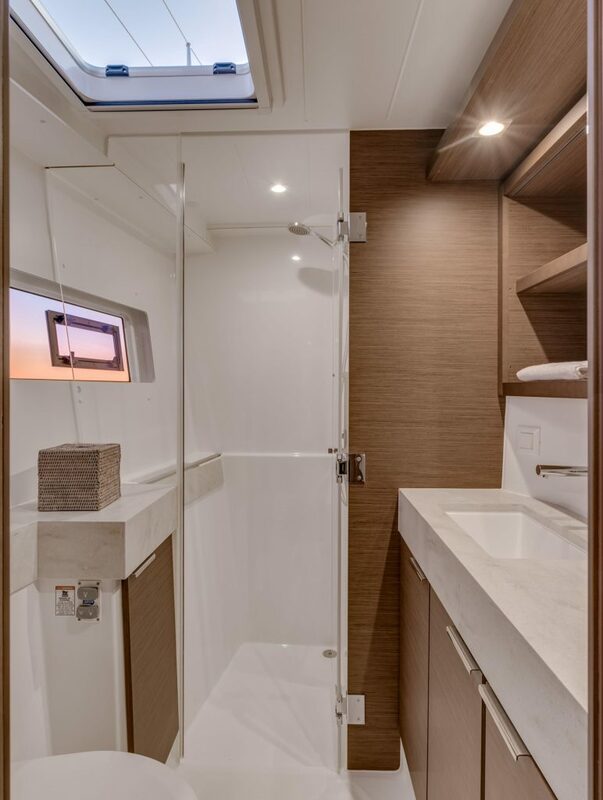 The sloping composite bimini offers decent sun protection and there are clear protective roll down screens if you should encounter a shower. 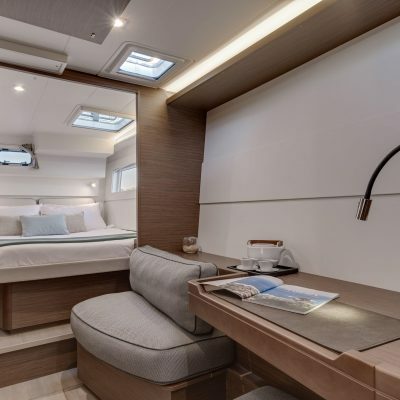 The slightly raised helm gives great visibility generally around the boat and the steps into the cockpit mean good interconnectivity with the crew. 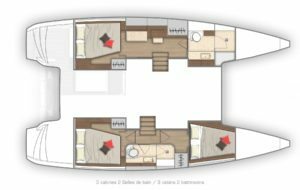 Moving around the deck is safe, the hatches are flush, and the side decks wide with decent handholds. 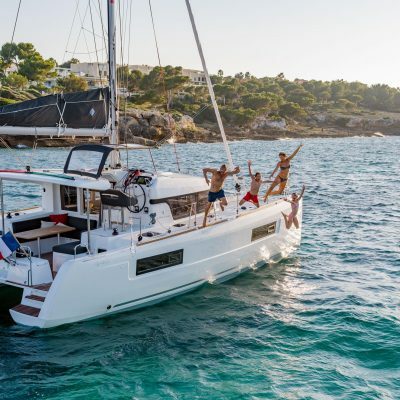 The boom is low to the coach-roof and access to the mainsail/stack pack for stowing is easy via steps from the helm position. 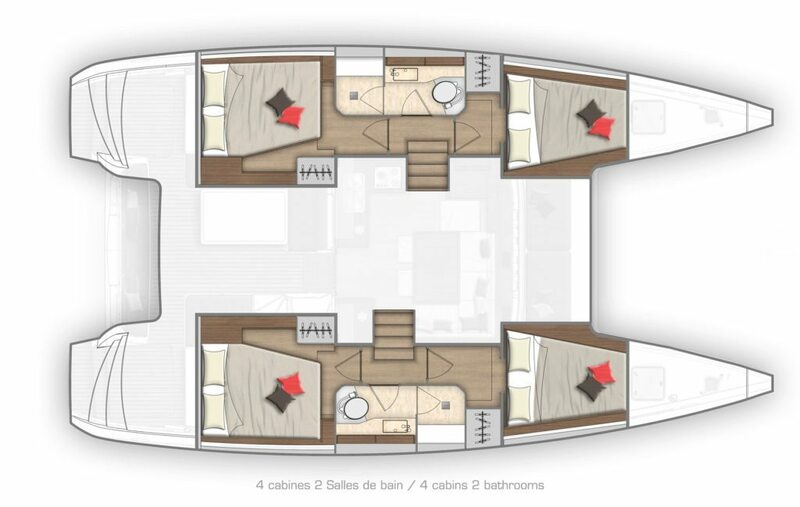 The whole design brings harmony between the rig and rest of the boat, it simply looks right. The transoms are wide and have just two steps to the cockpit level. 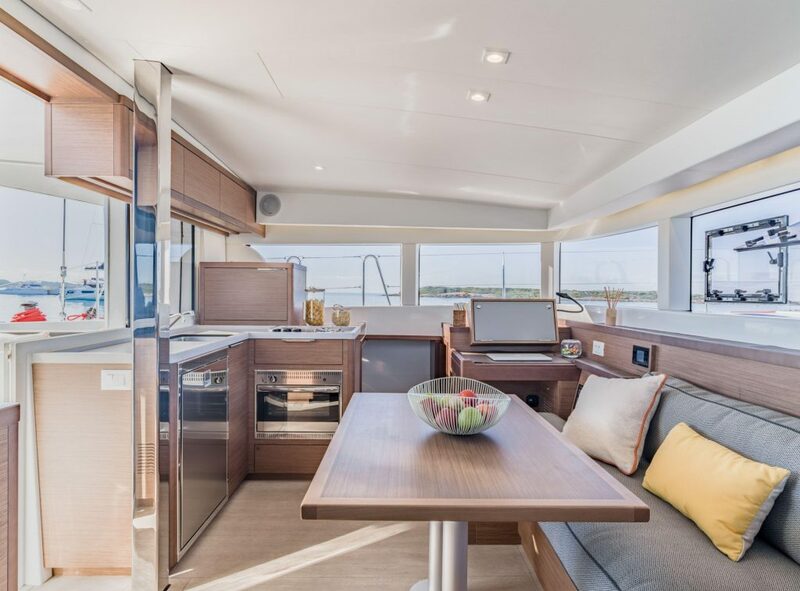 In the saloon, which feels like a comfortable apartment, the wrap around vertical windows bring masses of light as well as giving great panoramic views. 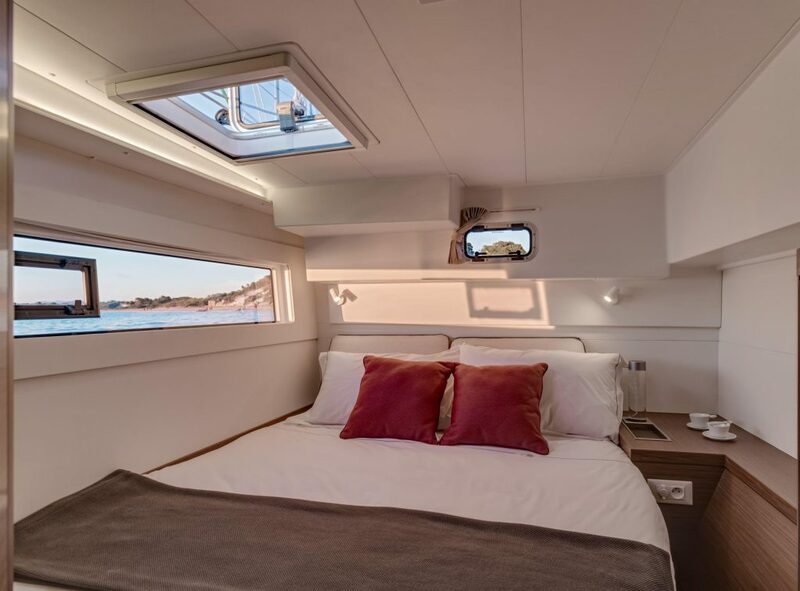 There are two opening windows forward which provide ventilation and an option for passing drinks forward to those sitting on the forward deck sun-cushions. 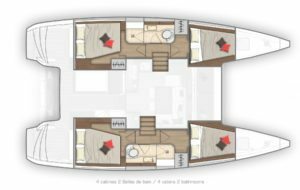 The headroom is 6’6 in the saloon with the nav station on the port side and the ‘lounge’ seating to starboard. 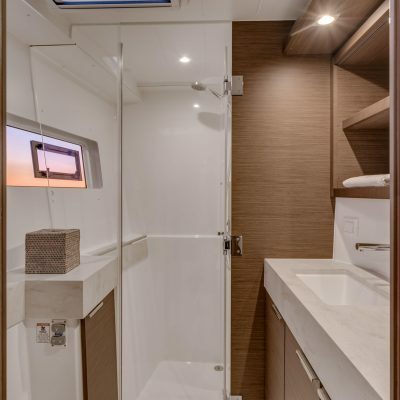 The galley has a three burner stove, fridge, and freezer as well as good low and high-level storage space and generous counter top areas. 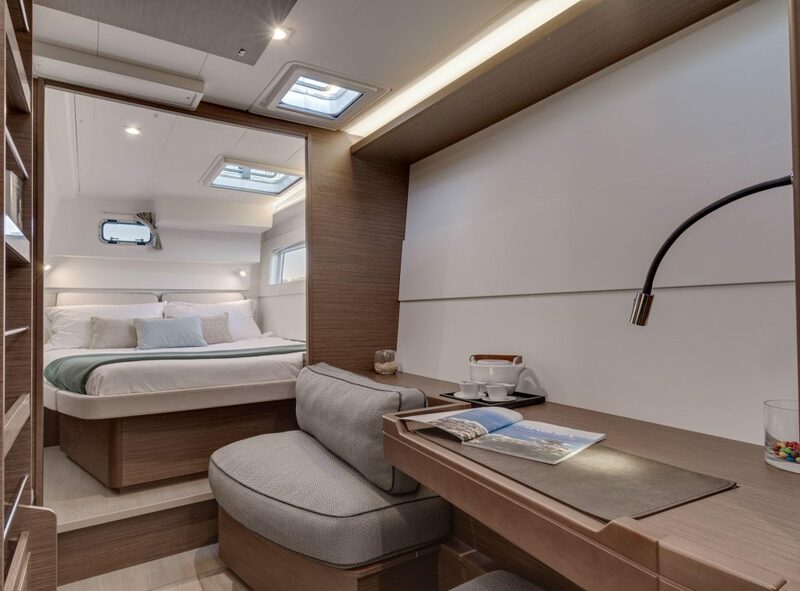 The interior hull design is smart and simple. 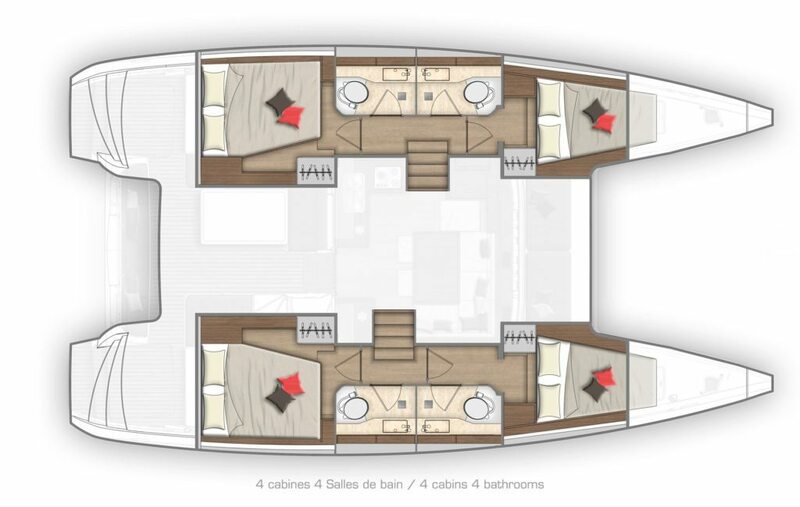 The joinery finish inside is walnut which brings an upscale quality. 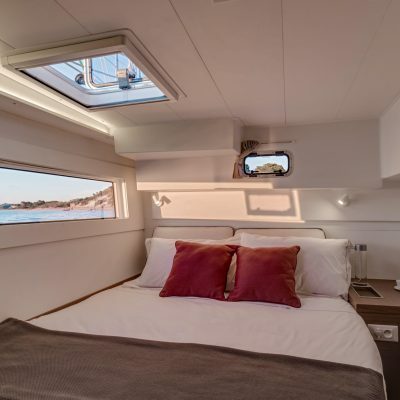 Large embedded port-lights allow plenty of natural light and make the cabins feel light and airy. 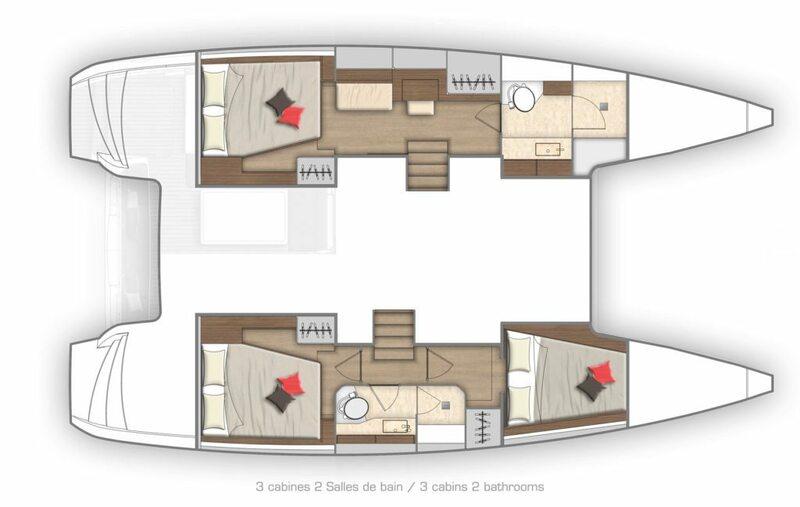 There are two designs, 3 or 4 cabins with 2/3/4heads. 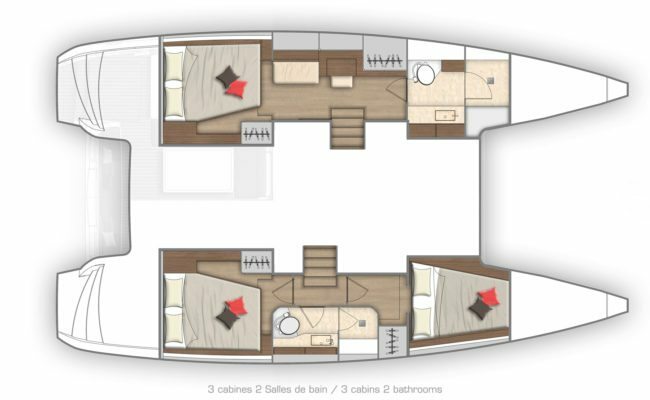 All are well thought through with decent storage and hanging space and comfortable double berths. 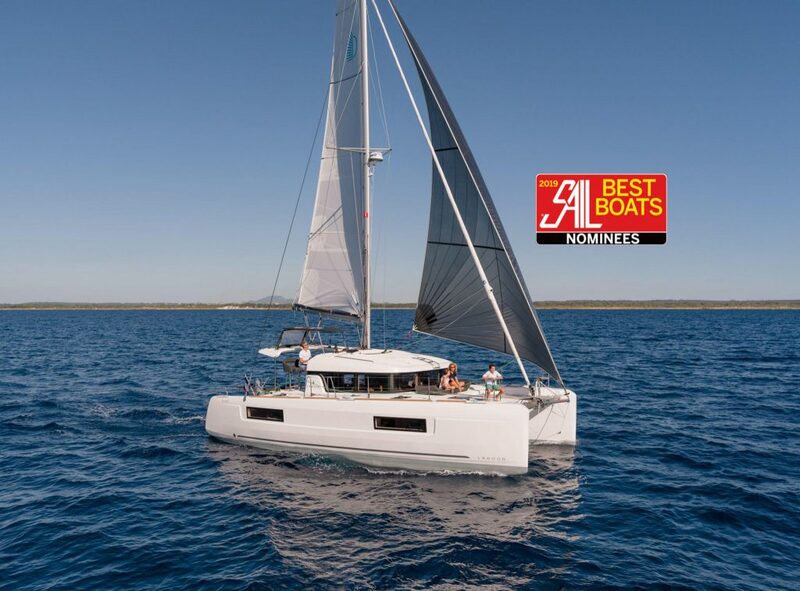 The Lagoon 40 catamaran is strong but lighter than her predecessors. Weight distribution is optimized to maintain strength and improve performance. 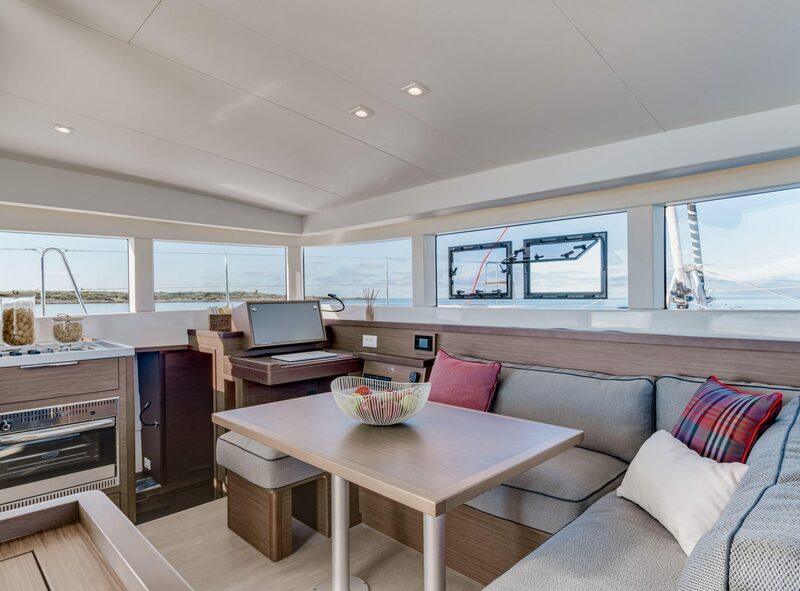 There is solid fiberglass below the waterline giving reassuring solidity but they have kept the weight low above the waterline with vacuum-infusion construction and balsa coring in the deck and the hull. 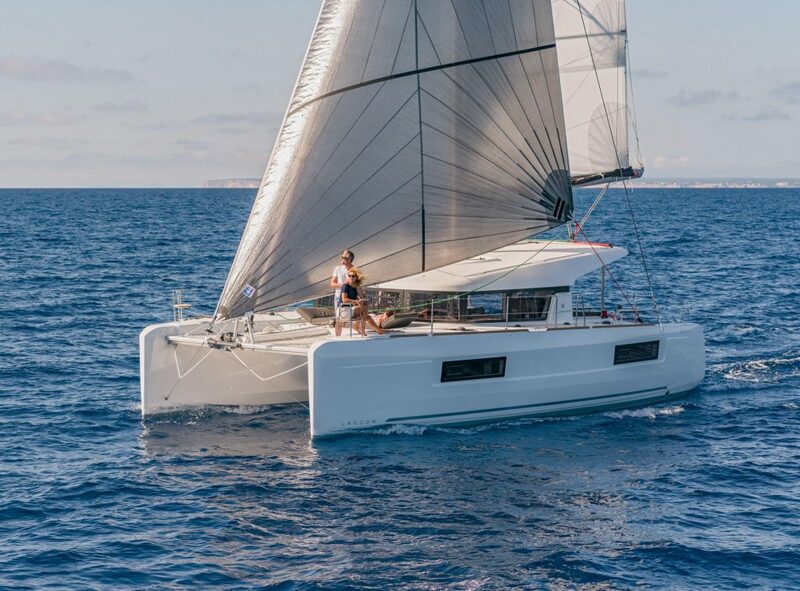 The aft rig position reduces pitching and the gull wing shaped narcelle reduces slamming in heavier seas. 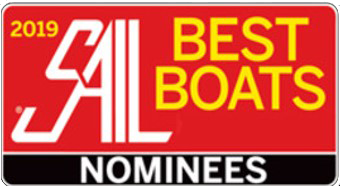 The newly squared off transoms are wide and make dinghy access much easier. Also, remember the anchor has the roller on the cross beam so anchoring and attaching the bridle is easy. She is easy to handle, looks good and she will get you from A to B quickly and in comfort. 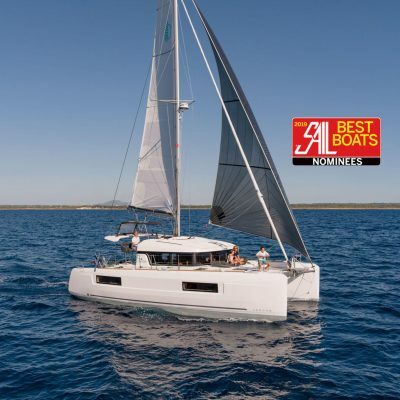 She is a great platform for couples and families to enjoy the sun and sea in the Caribbean.